At the beginning of the year, I joined the Sophomore Shadow Program, a voluntary competition between sophomores that incentivizes attending events and completing activities across campus. The more you participate and engage in these opportunities, the more points you earn and the closer you become to selecting your top choice corporate shadow experience in Portsmouth, Manchester, Boston, or even New York City. My biggest worry joining the program was that I wouldn’t have enough time. I balance five classes with a part time job and hold an executive office position for a club on campus. Every weekend and many week nights I am out on the road delivering food to hungry college students. I am also treasurer of the Yellow Ribbon Club where I manage the finances so that we can plan and run fundraisers to raise money for troops overseas. These responsibilities raised my doubts about whether or not I could participate in an additional activity, however, one of the best parts of the Sophomore Shadow Program is its flexibility. The program offers a large range of events on different days at all different times so I have been able to squeeze them in between my busy class schedule. Furthermore, the program provides web-based activities that I can complete whenever I have a few minutes to spare. From inspiring TED talks to informative articles, I’ve been able to complete many of the assignments at my own leisure. These assignments often include informative resources and tools to help discover more about yourself, your abilities, strengths, weaknesses and how all of these factors should relate to your future career. The program kickoff featured guest speaker Jullien Gordon who delivered an engrossing speech on the idea of building a career around what you love. He insisted that money isn’t the only metric and that it is possible to intertwine your career goals with your purpose and passion. These words were so important to hear sophomore year because this is the year that we all have to declare a major. The Sophomore Shadow Program has definitely helped ease the burden of this process by providing a range of exploratory activities to not just improve your skills, but to better understand yourself and how UNH can help you reach your goals. One of my favorite events as part of the program was the Resume Review session held at the Granite State Room. 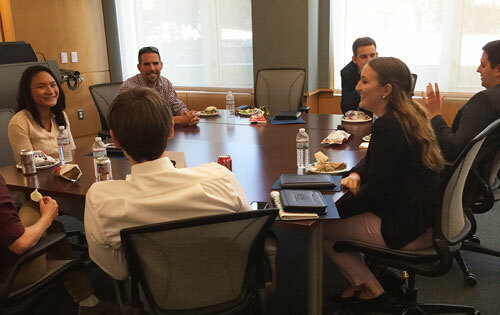 Representatives from local companies came to UNH and sat down one-on-one with students and provided real feedback on how to improve our resumes. I was able to receive constructive feedback from an experienced HR professional in charge of the new-hire process at her company. This type of networking and feedback is invaluable when searching for internships as well as future job placement. While the Sophomore Shadow Program does a fantastic job for professional development and academic exploration, it also covers many more topics. For instance, I’ve gained points by learning about all of the programs Health Services has to offer including stress management and personalized wellness plans. To be honest, I never would have explored these opportunities were it not for the program. Health is often is overlooked in college and it’s especially easy to lose track of your wellness when there’s all-you-can-eat pizza at the dining hall. However, maintaining a healthy lifestyle is vital to success as it can lead to better sleeping habits, less stress, and ultimately improve your academic performance. The Shadow Program has further helped academically by granting points for going to office hours as well as meeting with new faculty members. Meeting with professors one-on-one can be daunting at first but the Shadow Program has pushed me out of my comfort zone to establish and deepen these connections as well as improve myself academically. The next part of the program that I am looking forward to is the Team Case Study. I have been partnered with a wonderful group of students in my major and together we have been working to help solve real business issues. Even if we don’t win the competition, the experience thus far has been well worth the time and participation. By exposing me to the vast array of resources that UNH and Paul College has to offer I have been able to focus on my future, decide on a major and better prepare myself for the challenges of the next two years and life after college. Abigail Kourafas is a sophomore at the University of New Hampshire majoring in Business Administration with a focus in management. On campus, she is the treasurer of the Yellow Ribbon Club, an organization that raises money for US troops overseas. As a part of her role in the organization, she visits veteran’s homes, mails out care packages and travels to the Pease International Airport as a greeter to welcome our men and women home. Off-campus, Abigail works as a delivery driver at Domino’s in Durham. This past summer she had a business internship at XO Photo and also worked as a Personal Recruiter at Vector Marketing. She is excited to participate in more events for the Sophomore Shadow Program and can’t wait to see where the next opportunity leads.